I was thrilled when my friend Moira over at ClothesinBooks.com gave me a copy of this splendid book which brings together Tom Adams’s original cover designs for Agatha Christie’s novels. They are works of art in their own right. 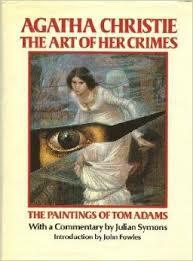 If I am looking to buy a second-hand paperback of an Agatha Christie, I always prefer one with an Adams cover. My copy of The Mirror Crack’d From Side to Side has the one that is featured here on the dust jacket and I think it is one of the very best of his designs. It inspired me to reread the novel (a late Miss Marple with a dazzingly original motive for murder!). Moira’s gift set me thinking how important book covers are – and how few really good and memorable ones there are these days. The current Christie covers are pretty insipid, though perhaps by now she is so famous that it doesn’t really matter. Authors do not have the final say, readers may be surprised to know. Though publishers do generally want their authors to be happy, untimately it is the marketing team who will judge what is most likely to sell the book. And it is not a neutral thing: a bad cover can actually deter a reader. I dislike covers which feature seductive women who have nothing to do with the plot and it has put me off buying one particular series. I have been lucky with Lion Fiction, my current publishers, and with St Martin’s Press, a little less so with Hale. Perhaps it is because of my background as an art historian, but it really matters to me what a book looks like, and I have been known to buy the US edition of Andrea Camilleri’s novels rather than the UK ones because I prefer the covers. I’d be interested to know how important it is to other readers. Do you judge a book by its cover? Any that you think are stunningly successful? I’ve been neglecting my blog a bit. It’s been very busy time for me as the CWA membership secretary. Subscriptions were due on 1st January and we have around 500 members so that’s an awful lot of renewal forms and cheques. (And by the way, if you’re a crime writer and you’re not a member, why not? You’re missing out on a lot of fun). To make matters more complicated, this year we have introduced online payment, so I am operating two systems, a paper one and an electronic one, which has made for a challenging first year in the job. There has still been time for reading, of course. I’ve enjoyed the latest Camilleri, THE TRACK OF THE SAND. Reading this and also reflecting on FREEDOM, the Jonathan Franzen novel, it strikes me that reticence is a an important quality in a writer and that there is enormous skill in knowing how to give the reader exactly the right amount and no more. It’s a common fault in new writers that they try to tell you everything. But it’s a courtesy to the reader to assume that they don’t need to have everything spelt out. There’s a good example in FREEDOM when disaster overtakes one of the characters – I won’t say more for fear of spoiling it – and Franzen doesn’t describe how she felt or what thoughts went through her head; we imagine that for ourselves and the scene is all the stronger for it. Similarly when Inspector Montalbana has a ill-judged sexual encounter, we don’t need a blow-by-blow account, but Camilleri tells us enough for us to understand the Inspector’s discomfort later. So: enough and no more. Sound easy, perhaps, but it is one of the hardest things to learn as a writer.